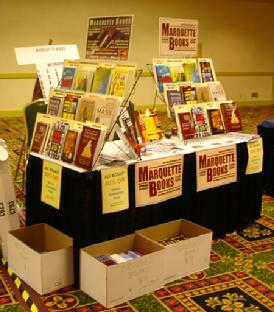 Marquette Books LLC is a full service book publishing company. We publish nonfiction and fiction books on any topic, albeit our short list currently focuses heavily on mass media and historical books (fiction and nonfiction). We're small, but we provide highly personalized service. If you are an author, we can provide as much or as little assistance as you need. We can edit, design, print, market and promote your book. If your book is selected for our title list, we pay all of the costs and provide you with a standard royalty, which is usually 15 percent of net sales. For more details about our contract options, click here. Our books are marketed and sold through several wholesalers, including Baker & Taylor, Blackwell's, Coutts and Midwest Library Service. We also sell directly to the public, bookstores and libraries. We are a member of the Independent Book Publishers Association (www.pma-online.org), which is the largest non-profit trade association representing independent publishers of books, audiobooks and e-books. We are delighted to provide you with a free consultation. Please call or e-mail us at the address below. Marquette Books offers substantial discounts off the list prices of our books to qualifying book wholesalers, distributors and book stores. For more information, please contact us at the address below.